Always crowded Tex-Mex eatery known for its oversize portions. 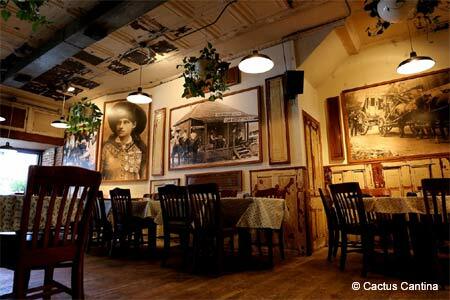 : Cactus Cantina is a colorful and always-crowded spot to take the family for lusty Tex-Mex in Cleveland Park. Tortillas are made in an elaborate glassed-in machine that may interest the kids while they’re waiting for a table. Once seated, don’t limit yourself to the combination platters. Some of the best offerings come from the mesquite grill --- barbecued quail, grilled shrimp, crusty spareribs and the inevitable fajitas. Start your meal with a tamale, soft and flavorful inside its cornhusk wrapping and stuffed with smoky shreds of pork. Portions are generous: Expect enough food for a doggie bag. Consider a Mexican beer to complement your meal.